One loyalty mission is all that stood between Saints Row IV and a MA15+ rating. 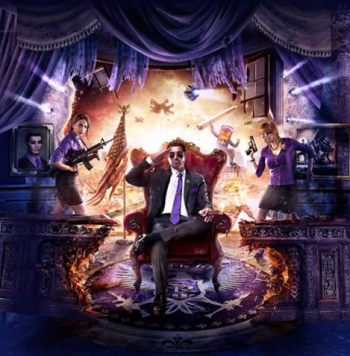 You may recall that the Australian government harbors a deep-rooted suspicion of Deep Silver's Saints Row IV. Naughtiness and depravity - stuff you wouldn't want your wife or servants to look at, Mr. Lawrence - has, so far, persuaded the Australian Classification Board to deny it even the adult R18+ rating. However good things come to those who just say no to drugs, and now that one loyalty mission - Shaundi's, involving alien narcotics - has been removed, the ACB has seen fit to grant it not the adult rating, but MA15+ status. Wives and servants may now rejoice, always preserving the decencies, naturally. "The removal of this mission has no negative impact on the story or the superpowers and will not detract from the enjoyment players will get from their Saints Row IV experience," says Deep Silver. Plus, it's only about 20 minutes of game time, hardly a dealbreaker. As for the Rectifier, the alien probe that goes where no other probes have gone before, it's still in as DLC. Turns out "drug use related to incentives and rewards is not permitted," as the ACB put it when the R18+ was denied, is the only element that had to be dropped. Saints Row IV, a PC, Xbox 360 and PS3 title, will come to Australia, and the rest of the world, in August 2013. Update: Apparently there's a co-op catch. Thanks to the deletion of the loyalty mission, Australian players won't be able to participate in co-op play, except with other Australians. "Due to the changes we were forced to make, this version is different than the version rated by rating boards like the ESRB, USK, and PEGI, which is why it will be incompatible with those versions in co-op," says the developer.